Mike Boyzuick is the Chief Operating Officer for LSO West. Mr. Boyzuick has nearly 25 years of leadership experience in the transportation and logistics industry. He has spent nearly half of his career in the small package arena with FedEx Ground in operational and sales roles where he was awarded the prestigious “5 Star” award. 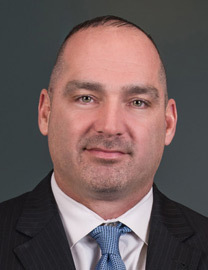 His career transitioned to the Cash Services industry where he spent nearly 10 years in executive leadership roles with Brinks Incorporated and Garda World. Recognized as a top executive in the industry, Boyzuick received the “Leader of the Year” award. Most recently he served as COO of All My Sons moving and storage. Mike joined LSO in 2016 and is taking the lead for many strategic initiatives that focus on providing world-class service and quality, organizational strength and facilitation for overall growth for the company. After attending college at the University of Georgia and LeMoyne college, Mike played three years of professional baseball in the LA Dodgers and Milwaukee Brewers organizations. Mike lives in Argyle, TX with his wife Susan and three children Brandon, Tanner and Katie.